As the 2014 regular season comes to a close, here are Devan's season awards. Mike Trout is the best player in the American League. He was snubbed out of the past two MVP awards to Miguel Cabrera and Miguel Cabrera, respectively. This year, he hasn't been nearly as good, hitting "only" a slash line of .287/.377/.561 with 36 home runs and a league-leading 111 runs batted in. However, he has struck out 184 times, which is a red flag for Trout's future. But then again, there has been nobody better than Trout and his fWAR leads all of baseball. Nobody's been more valuable than Mike. Felix Hernandez absolutely dominated this year. Only someone by the same of Clayton Kershaw has been better than he has, as his 15-6 record with his 2.29 ERA is good enough to win the award itself. But for good measure, he has struck out 248 hitters as compared to only 46 walks over his 236 innings pitched. His 2.56 FIP and 2.51 xFIP both suggest that Hernandez has been helped by some good luck this year. Hernandez has a 5.9 WAR, which ranks fourth in the AL. But his dominance deserves the Cy Young award overall. He's been absolutely fantastic. Lloyd McClendon took over a Mariners team that hasn't had a winning season since 2009 and almost took them to the postseason. A Mariners win and an Athletics loss would have done the trick, but Seattle fans were let down on the final day of the season when Oakland beat the Texas Ranger 6-0 to clinch the final American League playoff spot. But the Mariners have a young pitching staff, young lineup, and $200 million man Robinson Cano may be able to take them to October next year. Jose Abreu was fantastic at the beginning of the season, but cooled down greatly as the season went on. He hit 36 home runs, drove in 107, and posted a .317 batting average. If there has been any rookie better than Abreu, let me know. As for the Sabermetrics, Abreu has a 165 wRC+ (weighted runs created plus) and a 5.2 WAR, well ahead of any rookie in either league, let alone the American League. I would expect Abreu to finish in the top-10 in the MVP voting and wrap up the Rookie of the Year award easily, perhaps even unanimously. The future is bright for the young power hitter. Just last season, Wade Davis was one of the worst players in the Royals pitching staff, going 8-11 with a 5.32 ERA and a 1.677 WHIP. He posted a 78 ERA+, meaning that his ERA was 22% worse than the average pitcher, including park factors. This season, Davis was converted to a back end of the bullpen relief pitcher, going 9-2 with a 1.00 ERA and a 0.847 WHIP. He has a 109 to 23 strikeout-to-walk ratio in 72 innings pitched. His ERA+? A whopping 399. That is basically saying that Davis' ERA is 299 percent better than the average pitcher. This comeback was astronomical. You have to give some recognition to the best defenders. Alex Gordon has been lights-out in center for Kansas City. He has 27 defensive runs saved and has posted a 21.9 UZR (Ultimate Zone Rating), which measures the outfield arm runs above average, double play runs above average, range runs above average, and error runs above average and combines them. Gordon's range and arm has been fantastic this year and has made a lot of tough plays in the outfield, including a whopping 17.6% of "remote" plays (as determined by scouts) made, which generally is between 1-10%. Nobody in the National League has been better than Clayton Kershaw has this season. Let me repeat: nobody. Not Giancarlo Stanton, nor anyone else. Sure, some people may be against giving pitchers MVP awards, but Clayton Kershaw's 2014 season has been the best pitching season (in terms of ERA below 1.80) since Pedro Martinez's 2000 campaign. Kershaw's numbers are unbelievable; he's 21-3 with a 1.77 ERA, 1.81 FIP, and 2.07 xFIP in just 27 starts due to injury. He's struck out 239 and only walked 31. His season is better than Justin Verlander's 2011 MVP season. He's the best of the best in the NL. If Kershaw is the MVP, there is absolutely no reason as to why he shouldn't be the Cy Young award winner. That's my logic. Bruce Bochy has had to battle injuries to his offense and pitching staff and the Los Angeles Dodgers this season, but has still been able to bring the San Francisco Giants back to the playoffs with a Wild Card birth. Bochy is a managerial wizard, and he definitely proved that this season. Even with all the woes, he led the team to an 12 win improvement last season and will be leading them to their third postseason under him. The result of the first two? World Series championships. I recently wrote an article on why Jacob deGrom should win the National League Rookie of the Year over Billy Hamilton. Hamilton hasn't done anything to change my mind on that, so deGrom is still my pick to win the award. On the year, he is 9-6 with a 2.69 ERA, 2.67 FIP, and 3.03 xFIP on the season in 22 starts with the New York Mets. His 3.0 fWAR ranks fourth among rookie starters and tops in the National League. Hamilton's low OBP and high caught stealing rate really sealed the deal for deGrom. Edinson Volquez signed a one-year, $5 million "prove it" deal with the Pittsburgh Pirates prior to this season and boy did he prove it. Volquez, fresh off a season where he posted a 5.71 ERA, has gone 13-7 with a 3.04 ERA, 4.15 FIP, and 4.20 xFIP in 192 2/3 innings pitched. He has struck out 140 and walked 71, as compared to a 142 to 77 ratio last year in 22 1/3 less innings. Now he is headed to the postseason, where he will start the National League Wild Card game. Jason Heyward continually made outstanding catches and unbelievable throws in right field for the Atlanta Braves. His UZR is the highest in baseball with a 25.3 mark. His range runs above average is tops in the majors as well, 5.7 runs above better than the next highest defender (Chase Headley). In terms of Inside Edge Fielding, Heyward has made 62.5% of "unlikely" plays, which is generally in the 10-40% range. Heyward has been the best defender of anyone this season. "Now batting for the Yankees, number 2, shortstop Derek Jeter. Number 2," echoed through Yankees Stadium for the last time on Thursday night. If you say those two words to any person in America -- baseball fan or not -- they'll likely have something to say, memories to relive. Jeter is a leader. Jeter is a fighter. Jeter is a ballplayer. There isn't is any other player in this game that you give those qualities. Every shortstop out in Little League wants to become the next of him, wants to do what he does, and wants to be like him. And with good reason. Regardless of his accomplishments on the field, Derek Jeter is one of the most respected people in America. He gives to charity. He even has his own foundation! He plays the game the right way. And he has been in the spotlight ever since Jeter came up to the show as a baby-faced rookie at the age of 21. And since appearing in 15 games in 1995, Jeter has been the shortstop. It's hard to imagine how baseball will go on without him. We are used to seeing number 2 suit up for the New York Yankees every day. And yet, we know that he will never be putting on the pinstripes ever again. He has recorded 3,463 hits (in counting), good for sixth all-time in the Major Leagues. He has been to 13 All-Star Games, a mind-boggeling stat within itself. He has five World Series rings, including the 2000 World Series MVP. And he has played in enough postseason games -- 158 -- to account for another season in itself. He has a career .308 average in October. I remember when Jeter got his 3,000th hit. It was a hot July day, July 9, 2011, to be exact. Jeter was sitting on 2,998 hits. After a single in the first for his 2,999th hit, fans become anxious for Jeter's 3,000th. He delivered, but not in any ordinary fashion. Jeter homered for hit number 3,000. Although power has never been a big part of Jeter's game, his 3,000th hit left the yard, only the second player in MLB history (Wade Boggs) to do that. Of course, Jeter ended the game with 3,003 hits, going 5-for-5 on the day. We thought that was a storybook ending. Two nights ago, in Jeter's final game at Yankees Stadium, and likely his final game playing shortstop for the Bronx Bombers, Jeter played an emotional role in the Yankees victory. Like Mariano Rivera last season, Jeter could have been pulled in the final inning, walking off to a standing ovation with the Yankees leading 5-2. However, after two Baltimore homers, the game was tied, and Jeter was due up third in the bottom of the ninth. With a runner on second base and only one out, Jeter really walked off to a standing ovation in Yankees Stadium. Both figuratively and literally. Jeter took the first pitch opposite field to right, hitting a walk-off RBI Single to cap his Yankees Stadium career. An emotional crowd and an emotional Jeter witnessed history once again. Anyone who can say they saw Jeter in person has seen a part of baseball history. It doesn't matter if he went 5-for-5, was the hero, or even struck out three times. Jeter is an icon. Jeter is a legend. Anyone who says they saw him play witnessed something very special. They witnessed something that they can tell their grandchildren. "You really saw Jeter play?" they would ask, wide-eyed. "Yep, with my two own eyes," you respond. You can tell them all about Jeter and what he has done for baseball. I wish Jeter all the best in retirement. I, along with baseball fans everywhere, will always have a soft spot when you hear the name itself. "Now batting for the Yankees, number 2, shortstop Derek Jeter..."
As I read an article by Rob Neyer of FOX Sports a few days ago, I became furious. It was a very good article, as it discussed the first reason as to why we will miss Commissioner Bud Selig. That was because it appears that baseball may be leaning toward putting advertisements on jerseys. This is new revenue. And I think there’s always ownership support for new revenue, right? And, I think that also, quite frankly, we are, owners, very cognizant of ticket prices. And, if this is a way to — and I’m not saying it’s going to be mutually exclusive. I’m not saying, "Wow, if there’s advertising on uniforms, then ticket prices are going to be frozen for the next five years." I’m not giving to say that. But I do believe that, um, that could be potentially a better alternative. We would support, the Giants would support, this is a better alternative than continuous ticket price increases across the board to fund operations . . . I don’t know who would be on the sleeve, or, whatever. Something tells me it will be a sleeve. It would start with a sleeve. Yes, advertisements on jerseys would continue to make baseball profitable, but they would absolutely disgust me. It is completely inappropriate for America's Pastime to earn an extra buck with some advertisements on the sleeves of jerseys. It's bad that corporate sponsors already have taken over stadium names. The Braves are moving out of Turner Field for a completely new stadium by the name of SunTrust Park. The best stadium names are the ones that don't have a corporate sponsor, even if the name is something as simple of "Nationals Park." But that is another issue for another time. As for the advertisements on jerseys, how would Yankees fans feel if their traditional blue pinstripes had a sleeve advertising a product or a company? Baseball is often criticized for "living in the past" and trying to remain true to itself. But one thing that needs to remain true to itself are their jerseys, hands down. And once advertisements are put on jerseys, that opens a whole new can of worms on where else they could put advertisements. I hope that you agree with me in that advertisements are to be nowhere near the jersey. I'm fine with advertisements on the outfield walls, okay with stadium names as a company name, but one thing that should never, ever happen is jerseys promoting something besides the team name. Is it time for the Braves to move on from GM Frank Wren? The Atlanta Braves are on their way to their first losing season since 2008. The team has looked tired, inactive, and unenergized all season, and today, they were officially mathematically eliminated from the playoffs today. Is it time for Atlanta to move on from general manager Frank Wren? Wren hasn't done too much to make last year's Atlanta team (they lost in the NLDS) better this year. He signed starting pitcher Ervin Santana to a one-year deal in March, after finding out that Brandon Beachy and Kris Medlen were both done for the year with elbow surgeries. Santana hasn't been too bad for Atlanta as he is 14-9 with a 3.74 ERA in 29 starts this season. On July 31, the non-waiver trade deadline, and Atlanta sitting just 1.5 games back of the National League East leading Washington Nationals, Wren had a decision to make. He could have bought at the deadline to add to the club for a postseason run or he could have decided to sell players who will be free agents at the end of the year, like Santana. The issue with that is that the Braves have locked up most of their veteran players. Of the players that were on their roster on July 30, just Santana, Ryan Doumit, Gavin Floyd, Gerald Laird, and Aaron Harang would be free agents at the end of this season. Santana was the only trade piece that could have perhaps netted a decent return for the Braves. If Wren really wanted to sell, he could have traded some of the 2015 free agents. Those would have netted him a very good return. Justin Upton, Jason Heyward, Kris Medlen, and Jonny Venters are all free agents at the end of next season. Again, Atlanta had a 58-51 record, and sat just 1.5 games back, so trading any of those players would have made absolutely no sense. The one subtle move that Wren did make for the Braves was an interesting one. He traded Victor Caratini, a minor league catcher/third baseman, to the Cubs, for Emilio Bonifacio and James Russell. Bonifacio is a free agent at the end of the season, so his time in Atlanta appears to be short-lived, but the Braves acquired a very interesting bullpen piece in Russell. The 28-year-old is 0-2 with a 3.33 ERA in 51.1 innings this year with the Cubs and the Braves. The Braves rank 12th in the major leagues in payroll with around $112 million. The record that they are sporting doesn't reflect the one that is paying their players $112 million. But when you have the Phillies and Red Sox, who rank sixth and seventh in payroll, sitting at the bottom of their respective decisions, a second place finish in the National League East isn't that bad. Frank Wren should still be the Braves general manager come 2015. I would probably make every decision he made last offseason and this trade deadline. He didn't know that Beachy and Medlen would go down with injuries in the beginning of the year. So then he went out and got Ervin Santana. He didn't deal any of his 2015 free agents to still make a run next season. He didn't deal any of his 2014 free agents, well, because none of them were desirable at all. Wren is doing his job, at least I think, pretty darn well. Perhaps it is time to move on from manager Fredi Gonzalez. The Braves have looked sluggish over these past couple of weeks. It may be possible he's lost support in the clubhouse. But I know that one thing is for sure. And that is that Frank Wren should still be the Braves' general manager in 2015. NL Rookie of the Year: Billy Hamilton or Jacob deGrom? One of the most heated debates in baseball isn't who's going to win the MVP this year. Sure, we could talk for days on why I'm picking whom over whom, but when it all comes down to business, it'll likely be Mike Trout in the American League and either Clayton Kershaw or Giancarlo Stanton in the National League. But there is one awards race where many people are differing. That race is the National League Rookie of the Year race. There are two main contenders -- Reds' speedy center fielder Billy Hamilton or Mets' right-hander Jacob deGrom. deGrom has broken onto the major league scene this season, and the 26-year-old and former 9th round pick (2010) has been quite a story. He made his first start on May 15 and the rest is history. Hamilton, on the other hand, was called up at the end last season, and was the clear favorite to win the award at the beginning of the year. His speed and defense could win him the award, but his hitting has not been as good as people thought. Hamilton, 24, has played in 145 games totaling 588 plate appearances. He's hit .258/.298/.366 with six home runs and 48 runs batted in. Hamilton has stolen 56 bases, good for second in the National League (Dee Gordon, 62 stolen bases), but has only had a 72 percent success rate, as catchers have thrown him out a National League leading 22 times. A batter that has a .258 batting average and a .298 on-base percentage, however, does not deserve to be winning any awards. However, there is an argument for Hamilton as well. His 3.4 fWAR ranks 25th (of hitters) in the National League and third of all rookies (first in the National League) in the majors. In terms of base running, Hamilton's base running runs above average (BsR) is 7.0, which, according to FanGraphs.com, makes him the sixth-best base runner in the major leagues overall. Defensively, Hamilton has a 17.2 defense rating, which is eighth of all fielders in the major leagues, and second only to Jason Heyward of outfielders. As for deGrom, he is 8-6 with a 2.68 ERA, 2.72 FIP (Fielding Independent Pitching), and a 1.139 WHIP in 21 starts. He's struck out 134 hitters and walked only 40 in 134 1/3 innings. His last start yesterday against the Miami Marlins may have sealed him the award. He went seven innings, allowing six hits, three runs (all earned), striking out thirteen, walking only one. If that isn't Rookie of the Year worthy, I'm not sure what is. deGrom ranks 16th in the major leagues in ERA of pitchers with a minimum 100 innings pitched. His FIP ranks 12th in the majors. As compared to other rookie pitchers, deGrom ranks third in the major leagues in ERA and tops among National League rookies. In terms of pitcher's fWAR, deGrom is still tops in the National League with a 2.8 fWAR, but is fourth in the majors overall. Of his starts this season, 76 percent (16 of 21) have been quality starts (six innings or longer, three earned runs allowed or less). 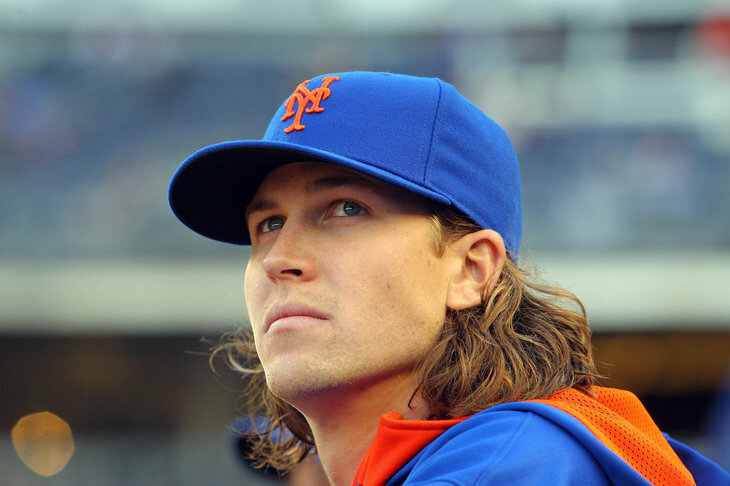 Of the two options, deGrom would be my choice for National League Rookie of the Year. He is so far ahead of all fellow National League rookies in his class. deGrom has shown a magic in his stuff and performance this year that has been hard to quantify, but the numbers don't lie either. I feel that people are talking about him and his dominance more than Hamilton's. deGrom is 26-years-old and has been masterful this season, as only three of his 21 starts have allowed four earned runs or more. He's had seven starts that have allowed zero runs and every one has gone six innings or longer. Jacob deGrom is my pick for the National League Rookie of the Year.